The traditional 100% pure wool Irish sweater is named after the Irish archipelago of Aran Islands located off the West coast near Galway, where it was created. 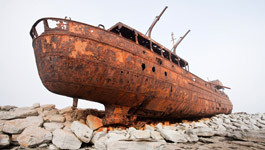 This is a land of fishermen and farmers, living under harsh weather mostly rainy and windy. Women began to weave wool from the many sheep living on the island, knitting jumpers to protect their husbands from the long wet winter months. The Aran jumper was born. Ongoing debates still discuss the exact date of birth of Aran sweaters, but it is reckoned that they appeared in the early 1900s. 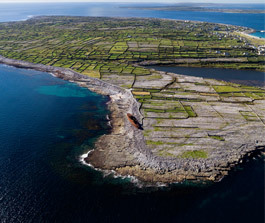 18 kilometers away from the coast, the archipelago consists of three islands: Inis Mor, Inis Meain and Inis Oirr. 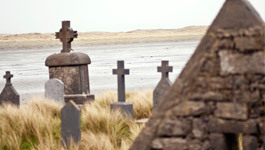 On the last census, in 2006, 1225 inhabitants were living on the islands in total. 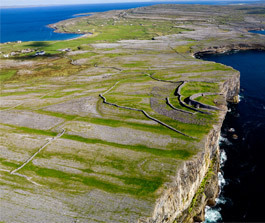 Inis Mor is the biggest and the most visited due to the Dun Aonghasa fort overlooking cliffs of more than 100 meters height, and the 7 churches site, a renowned cultural and architectural heritage. 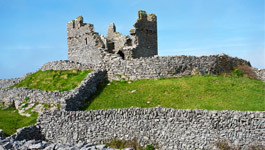 Inis Meain is the most rugged, and is now a recognised destination for underwater diving and its poetry classes delivered on shore... Inis Oirr is today quite touristic thanks to its famous castle and church ruins. Inis translates as “island” in Gaelic. 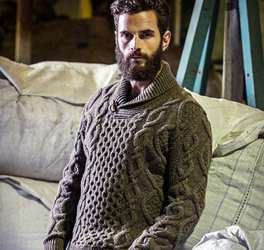 This word is used also in the Inis Crafts brand name, specialised in the making of Aran sweaters. The traditional Irish sweater is crafted with pure virgin wool, of a natural off-white (beige) colour, round-necked and extremely tight-woven. This jumper protects from the rain and keeps you warm. A hand-knit jumper is considered as a masterpiece, with more than 100 000 stitches for one jumper and up to 60 days of knitting. The sheep were always shorn in May. The wool was washed, brushed and spun to create the yarn, rolled into heavy bobbins ready to use. The jumpers had to be water-repellent garments and keep a sailor warm, and feature recognisable cable patterns and other symbols to identify its family and clan if he ever was found drown, victim of life at sea. Originally, Aran jumpers were knit with un-scoured or “fat” wool that retained its natural oils or lanolin, but today’s wool is washed and dyed to craft more comfortable and attractive garments. 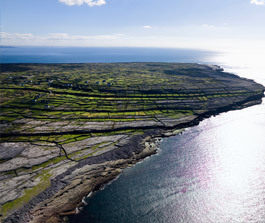 The Zigzag stitch, a figuration of the winding tracks of Aran Island, and of the hurdles of married life. The Diamond stitch is a representation of a fisherman’s net and prosperity. 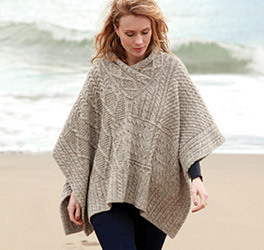 The Trellis stitch depicts little squares of land with a stone separation and symbolizes success. The Irish moss stitch represents the moss growing on the Irish islands’ shores and is a symbol of nature and fertility of the soil. Nowadays, everybody may choose their favourite patterns. 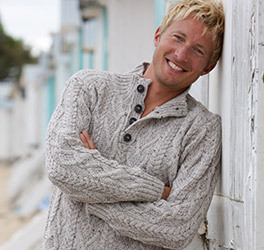 Through centuries, Aran sweaters became unique and iconic the fashion world. The story goes that the Aran sweater was brought forward when worn by Marilyn Monroe in “The Millionaire” in 1953, and then by President Kennedy in 1961, or Steve McQueen. The Irish Jumper even reached the Fashion Week podiums, from New-York to Paris, London and Milan, and became thus very popular. Celebrities such as Alexa Chung, Sarah Jessica Parker, Katie Holmes, Robert Pattinson, Gwyneth Paltrow, Channing Tatum, Nicole Kidman, Ewan McGregor, Cameron Diaz or Kate Bosworth have been photographed or filmed wearing an Aran jumper. 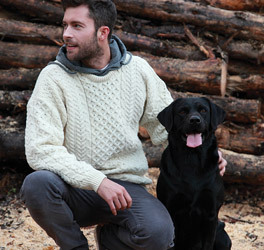 Discover our selection of Aran sweaters and jackets and buy yours by clicking here.